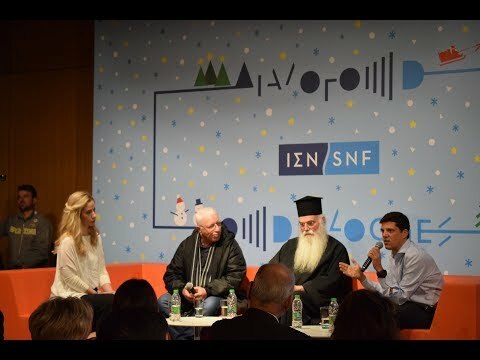 On Wednesday December 20th, 2017, the Stavros Niarchos Foundation (SNF) held the second event of its new monthly series, DIALOGUES, entitled "DIALOGUES: Surrounded by the Christmas Spirit". The event took place at the Book Castle of the National Library of Greece, at the Stavros Niarchos Foundation Cultural Center. His Eminence Metropolitan Bishop Nikolaos of the Holy Metropolis of Mesogaia and Lavreotiki, and chef Alexandros Papandreou met on stage and delved into an in-depth discussion about the essence of altruism and giving as a way of thinking that translates into action not only during the holiday season but throughout the year, the basic “ingredients” of giving, as well as what is the true meaning of the holidays and faith nowadays. Drawing on their own personal experience, the panel participants argued whether there is a culture of giving in Greece and looked at whether the sense of social solidarity grows indeed stronger as a response to the crisis. His Eminence Metropolitan Bishop Nikolaos of the Holy Metropolis of Mesogaia and Lavreotiki added another dimension to Christmas, by talking about the project that he personally envisioned and managed to realize, the creation of the “Galilee” Palliative Care Unit, a model palliative care structure. The SNF has supported through a grant the completion of Galilee’s Palliative Care Inpatient Unit, which offers free of charge, comprehensive and continuous palliative care to patients with terminal cancer, as well as to their families, thereby assisting them in achieving the best possible quality of life. In addition, the SNF works closely with Galilee and six other organizations to map the existing needs in the field of palliative care across the country. The event also featured the work of Shedia street magazine, through the eyes of its salesperson, Michalis Samolis. The SNF has supported through its grants the establishment and operation of Shedia magazine, the only magazine in Greece that supports the rehabilitation efforts of socially vulnerable groups and helps them tackle social exclusion. At the event, the Children’s Choir of the Greek National Opera performed traditional carols, spreading the Christmas cheer! Through the monthly series of live events, entitled DIALOGUES, the SNF presents, among others, individuals who inspire through their work and actions and hopes to catalyze conversations around critical issues, around the world.